Wood Stork's Endangered Status Is Up In The Air The U.S. Fish and Wildlife may upgrade the wood stork's status from "endangered" to "threatened." But some environmentalists and the Audubon Society says that in south Florida, the bird's population is still a long way from reaching a full recovery. 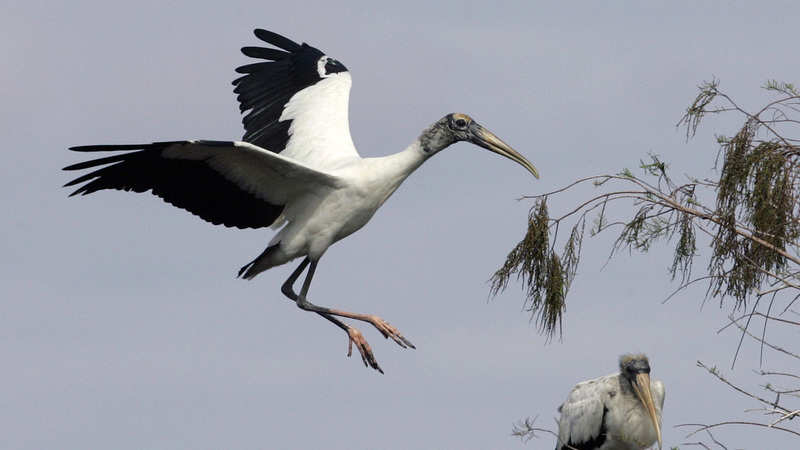 A wood stork prepares to land in a tree at Big Cypress National Preserve in Florida in 2005. The bird's wingspan can reach more than six feet. The last few years have been especially tough in South Florida for wading birds such as egrets, herons, ibises and wood storks that feed and nest in the region's wetlands. The problem is there are fewer wetlands, and the last few years have been dry, reducing water levels in critical areas. Despite that, the federal government says one wading bird, the wood stork, is doing well enough that it may soon be removed from the endangered list. In December, the U.S. Fish and Wildlife Service announced it planned to upgrade the wood stork's status — moving it from "endangered" to "threatened." (The agency is accepting public comment on the move; a decision is expected later this year.) Yet the Audubon Society says that in South Florida, there are still multiple conditions that threaten the bird's recovery. The Corkscrew Swamp Sanctuary in Southwest Florida is a bird-watcher's paradise with 13,000 acres of wetlands and old-growth cypress trees. It is named for the old Corkscrew River, which begins in the swamps and marshes inside the sanctuary. The National Audubon Society acquired the land to preserve the sanctuary in the 1950s, in part because of Corkscrew's importance as a rookery for wood storks. The sanctuary's director, Jason Lauritsen, says its relevance was noticeable to experts such as renowned ornithologist Thomas Gilbert Pearson, who visited Corkscrew and was awed by what he found. "Pearson identified what he estimated to be 100,000 wood storks in the nesting colony right here," Lauritsen says. "He wrote in his book that this was the most important wading bird colony in Florida." Wood stork sightings continue to grab visitors' attention. The birds are more than three feet high, with bald heads and black-and-white plumage. Their wingspans can reach over six feet long. A wood stork soars over its nest in Corkscrew Swamp Sanctuary near Fort Myers, Fla., in 2008, as baby wood storks wait in their nest for an adult to bring food. By the 1970s though, because of habitat loss and drought, Florida's wood stork population fell to just a couple of thousand. The population has since bounced back. But at Corkscrew, even today, wood storks are in short supply. 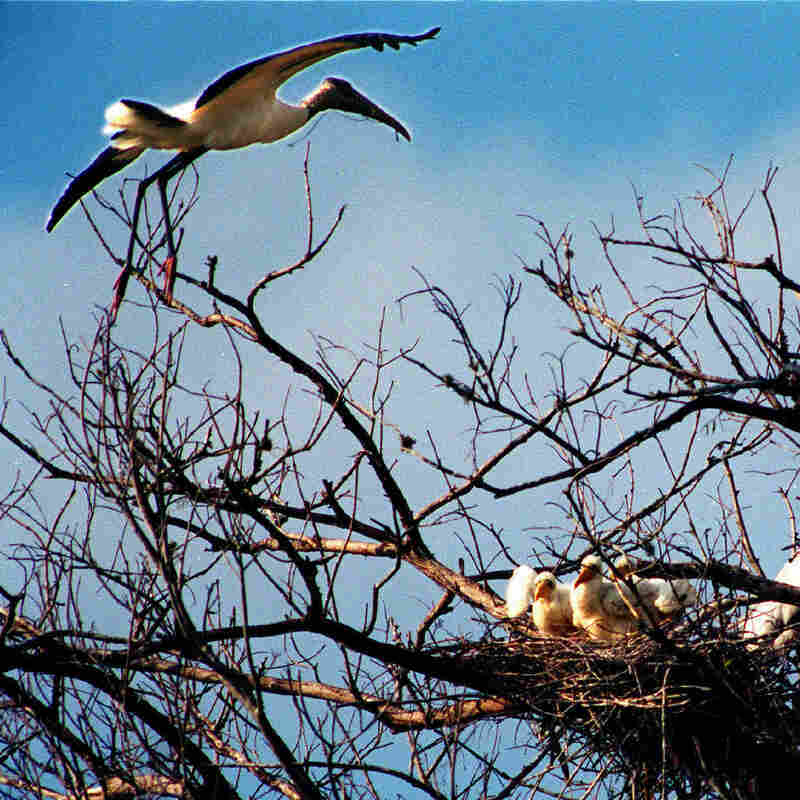 Lauritsen says that in the past he has counted as many as 60 wood stork nests in a single cypress tree. It's been 14 years though since wood storks have nested at a section of the boardwalk they once favored. Lauritsen, and others involved in wood stork conservation, are concerned. While wood storks have traditionally liked to nest in Corkscrew, they may fly 50 miles in a day looking for shallow pools where they forage for food. In this part of Southwest Florida, between fast-growing Naples and Fort Myers, many of the wetlands have been drained and filled — especially one habitat that's critical for wood storks: shallow areas called wet prairies. "We've actually lost 82 percent of our wet prairies within the core foraging area for Corkscrew's wood storks," Lauritsen says. "That's what's behind their decline." A recent survey shows that throughout South Florida, the populations of wading bird, including wood storks, have declined dramatically over the past decade. Last year, according to the survey, every single wood stork nest in the region, 820 in all, either failed or was abandoned. As bleak as the picture is in South Florida, elsewhere in the state, and in Georgia and South Carolina, wood storks aren't doing badly. "What we've seen is this particular species of bird has rebounded significantly," says Chuck Underwood, a spokesman for the U.S. Fish and Wildlife Service. While South Florida historically has been the center of the wood stork's breeding population, development and dry conditions have forced the birds to feed and nest elsewhere. "Over the past several years, the bird has expanded further north and is breeding in larger and larger numbers in colonies all the way up into the very Southern, Southeastern portion of North Carolina," Underwood says. "So that is one of the reasons that we're at the point where the species is no longer dependent on that specific location in South Florida." Practically speaking, the decision to upgrade the wood stork's status, if it becomes final, won't remove any protections from the birds. But Alan DeSerio, an attorney with the Pacific Legal Foundation, a property-rights advocacy group that petitioned the government to make the change, says it's a step toward eventually removing the bird from the endangered species list. "We are happy, and I would assume most environmental groups would be very happy with the progress that the wood stork has made," DeSerio says. "It's really just no longer entitled to that designation of endangered." Audubon and other conservation groups are happy that the wood stork population has increased in recent years. But Audubon officials say they believe wood storks should stay on the endangered list. They say that until Florida improves its protection of wetlands and finishes restoring the Everglades, the long-term survival of the wood stork is still very much up in the air.